Draft Online or Live, in-person at Planet Hollywood Resort & Casino, Las Vegas. NEW FOR 2019: Main Event will have a record $500,000 grand prize and $3.1 million total prize pool. Add another Main Event team and save $200. Multiple team discount pricing is $1,500 for Online and $1,625 for Live in-person drafts. Simply click on JOIN button to receive the discounted pricing. Enter 2019 Main Event before the early bird deadline on May 31 for best pricing! Get $100 off the first team, $350 off regular pricing for each additional team. Reserve your team & discount with a simple $200 deposit (or full payment). Multiple team discount will be auto-applied. Simply click on JOIN button to receive the discounted pricing. DEADLINE TONIGHT, TUESDAY AUGUST 28: Early Draft Slot Announcement #3. All teams which are fully paid by Tuesday August 28th will be eligible to receive their FFPC Main Event draft positions next day on Wednesday, August 29th. Below are the FINAL GUARANTEED openings in the 2015 FFPC Main Event. Registrations will be winding down shortly and draft dates/times will close as they fill. Please register as soon as possible to avoid being shut out of your preferred draft time. Draft slots and league formation will be announced on Labor Day Weekend. These are FINAL GUARANTEED openings in the 2018 FFPC Main Event. Online drafts thru Saturday, September 8. The Main Event is sold out for 2016. Check out the Online Satellite and Victory Points Cash Leagues for ongoing drafts. There are only 2026 open spots remaining! Guaranteed Prize Structures Are Now Finalized! Guaranteed prize structures for the 2016 FFPC Main Event and 2016 Footballguys Players Championship have now been finalized! Don’t miss the excitement of playing in the two largest season-long contests in the world. 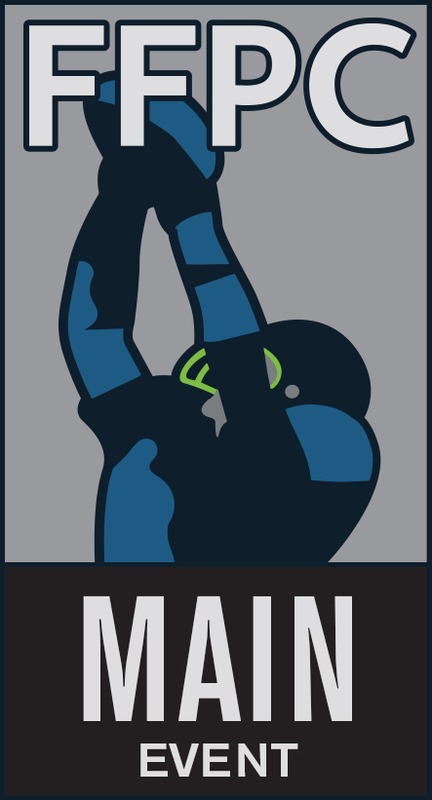 Early Bird Deadline for the FFPC Main Event ends on Tuesday, May 31st, 2016. Register and save $100 on your first team, $250 off each additional team. For those drafting Live, in-person in Las Vegas, register before the early bird deadline and get a free Thursday night stay at Westgate Resort & Casino during the FFPC live events in September. Click here for further details. Early Bird Deadline for the Footballguys Players Championship ends Thursday, June 30th, 2016. Register and receive a complimentary subscription to Footballguys.com Insider membership ($29.95 value). Purchase a 3-pack of FPC teams for $1,000 and receive a complimentary 3-year subscription ($64.95 value). Click here for further details. Click on the red X at the top right corner of this popup and we won’t show you this again.